The 25th December is nearly upon us, and I for one am counting down the days until I hop onto the train (read: crawl onto the train, dragging five bags of presents, food and baking equipment behind me) and head home for Christmas with my family. Love Christmas Day as I do, it's actually those much talked of days in between that I look forward to the most. It's the one time of year that I feel truly able to switch off, unplug, and forget what day of the week it is. It's also the perfect time for tinkering around in the kitchen and these days, I relish the lack of plans that this special time brings. One of my very favourite things to bake and eat at this time of year is Christmas cake and yet, adore it as I do, the traditional fruit cake isn't for everyone. For those of your party who aren't enamoured by the traditional variety, this gingerbread and maple cake is simply perfect. This elegant, festive gingerbread delight has a lightly spiced sponge and an indulgent maple buttercream. Finish the cake with semi-naked icing and classic seasonal decorations to create the perfect showstopper for the Christmas dinner table. I adore the decadence of gold leaf and - especially at this time of year - fully endorse using it as edible wallpaper. 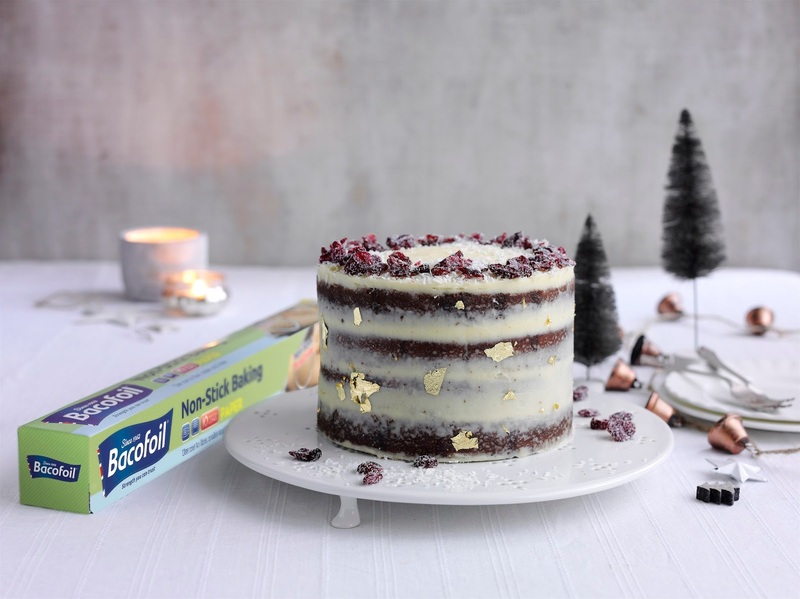 This recipe is by the wonderful Benjamina Ebuehi of GBBO fame, who has teamed up with Bacofoil to create a festive cake with a twist. Heat the oven to 180°C, and line two layer cake tins with Bacofoil Non-Stick Baking Paper. Heat the butter, treacle, golden syrup and vanilla in a saucepan until melted. Whisk in the brown sugar and set aside to cool. In a separate jug, whisk together the milk and eggs. Pour this into the butter and sugar mixture and whisk until fully combined. In a separate bowl, sift together the flour, bicarbonate of soda, baking powder, salt and spices. Make a well in the centre and pour the wet ingredients into the dry. Stir until there are no large lumps. Divide the batter evenly between two tins and bake in a preheated oven for 40-45 minutes. Whilst the cakes bake, heat the stem ginger syrup with 3 tbsp of water. Let it come to the boil before removing from the heat. Once the cakes are fully cooked, poke the surface with a skewer and pour over the hot syrup allowing it to soak through. Let the cakes cool before removing them from their tins and placing on a wire rack. When the layers are completely cool, wrap them in Bacofoil Cling Film and place in the fridge for at least 30 minutes to an hour to firm up. This keeps makes it easier to cut the cake in two, plus keeps the surface of the sponge really smooth and stops crumbs getting in the way during icing! Once chilled, unwrap the cakes and use a sharp serrated knife to cut each layer into two so you have four layers in total. Set aside whilst you make the buttercream. To make the buttercream, beat softened butter for 3-4 minutes until pale and creamy. Add in icing sugar and continue to beat for another 5-6 minutes. Pour in the maple syrup and beat until fully incorporated. Assemble the cake by sandwiching each layer with some buttercream. When you get to the last layer place it cut side up, giving you a completely flat top. Cover the whole cake with a thin layer of buttercream for a semi-naked effect. Swirl some extra buttercream on the top of the cake before decorating with desiccated coconut, gold leaf and sugared cranberries. This post was written in affiliation with Bacofoil, but all views are - as always - entirely my own. According to Rephraser rating ginger is the most popular product during Christmas holiday. I am sure that next year I will make this cake as well!